Ford was aided by a 42 percent jump in F-Series pickup sales. DETROIT -- Nissan Motor Co., Ford Motor Co., and Chrysler Group led the U.S. industry to a 20 percent sales gain in April as demand continued to recover from last year's collapse. Overall sales rose to 982,302 from 819,692 a year earlier. The seasonally adjusted annual sales rate was 11.5 million, the second strongest of the year behind March's 11.7 million. Ford said its retail sales rose 32 percent en route to a 25 percent overall gain, its fifth straight month of 20 percent or more. Toyota climbed sharply for the second straight month, again aided by no-interest loans and discount leases aimed at combating its recall crisis. Chrysler's 25 percent jump marked its first double-digit increase in almost five years. Nissan Motor was up 35 percent, and the Hyundai Group advanced 24 percent..
"We are putting the fundamentals together for a full-blown recovery," TrueCar.com analyst Jesse Toprak said, adding that April sales showed another month in a gradual return in consumer demand that was demolished in the past two years. "It's slow, but we are on the right track," he said. CLICK ON COLUMN HEADERS TO SORT BY FIELD. Today's results lifted year-to-date sales 17 percent above those of early 2009, when automakers battled the weakest demand in almost 30 years. General Motors Co.'s four surviving brands -- Chevrolet, GMC, Buick and Cadillac – recorded a combined increase of 20 percent. Overall sales for the automaker were up 7 percent. Among smaller automakers, Subaru racked up a 48 percent gain in April and Volkswagen of America boosted its sales 39 percent. At the other end of the spectrum, American Suzuki's April sales fell 23 percent and Porsche lost 6 percent. GM has predicted U.S. sales this year will total 11.3 million to 11.8 million light vehicles. Although GM economist Ted Chu said he thinks the second quarter will continue its current pace, he predicted a one-million-unit increase in second-half sales compared with the first six months. “Pent-up demand is building,” Chu said. GM is winding down Hummer, Pontiac and Saturn and has sold Saab. GM sold 9,150 Chevrolet Camaros, with about 7,800 of them going to individual customers. That's the highest retail total for the sports car since GM relaunched it in March 2009, said Steve Carlisle, vice president of U.S. sales operations. Sales of the Chevrolet Silverado rose 12 percent, and the pickup saw its second consecutive monthly increase in sales to individual customers, Carlisle said. Its GMC Sierra sibling saw deliveries increase 13 percent, with a 19 percent increase in retail sales. Ford was led by a jump of more than 42 percent in F-Series pickup trucks and a 41 percent rise in its Escape SUV. The automaker said fleet demand rose 13 percent, well below the 32 percent gain in retail sales. Chrysler's 25 percent advance was the biggest since a 27 percent gain in July 2005, when U.S. automakers offered all buyers the same discounts as employees. The average estimate for an industry sales pace of 11.4 million vehicles would compare with the 9.5 million of a year earlier, after the industry experienced the lowest U.S. demand in almost 30 years. Automakers were buoyed by consumer confidence that rose in April to its highest since September 2008, as measured by the Conference Board's monthly index. Toyota began offering incentives on March 2 such as subsidized leases after worldwide recalls of more than 8 million vehicles to fix defects linked to unintended acceleration and to adjust brakes. 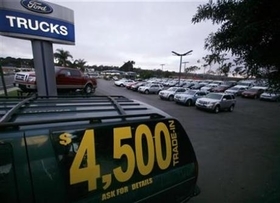 The company probably spent an average $2,416 on incentives on each vehicle last month, according to TrueCar.com. The industry average is about $2,798, TrueCar.com said. Incentives are down 4 percent from March 2009, when GM and Chrysler boosted spending ahead of their bankruptcy filings. John McEleney, who has a Toyota and a Buick, GMC and Cadillac dealership in Clinton, Iowa, said sales were up 30 percent at his Toyota store and increased about 20 percent among his GM brands. Chrissie Thompson, Jesse Snyder, Bloomberg and Reuters contributed to this report.